Yes, I know it's February, but I made this card last month and forgot to post it. I am continuing my personal challenge to make four Christmas cards per month between now and November, so I can mail them on time (which I did last Christmas, yay me!). I thought I'd start the year with non-traditional colors, and I really like the clean, modern look of the combination of Sahara Sand, Black and White. 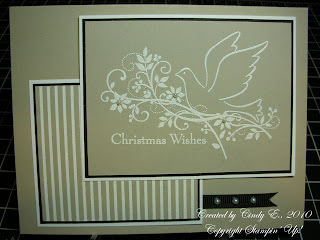 This card was very quick and easy to make, so I whipped out four of them in no time! That's a gorgeous card! And what a great idea. I think I'll try making four Christmas cards every month. I like it! Very pretty! I love the Sahara Sand with the black and white. Absolutely stunning. Where do you come up with all these fabulous ideas?